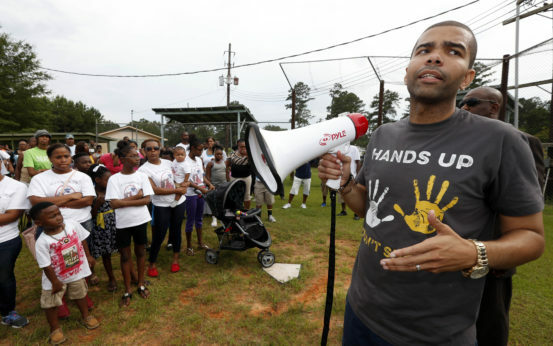 Youth Vote: Can Mayor Chokwe A. Lumumba succeed in Jackson, Miss.? Can Mayor Chokwe A. Lumumba succeed in Jackson, Miss.? 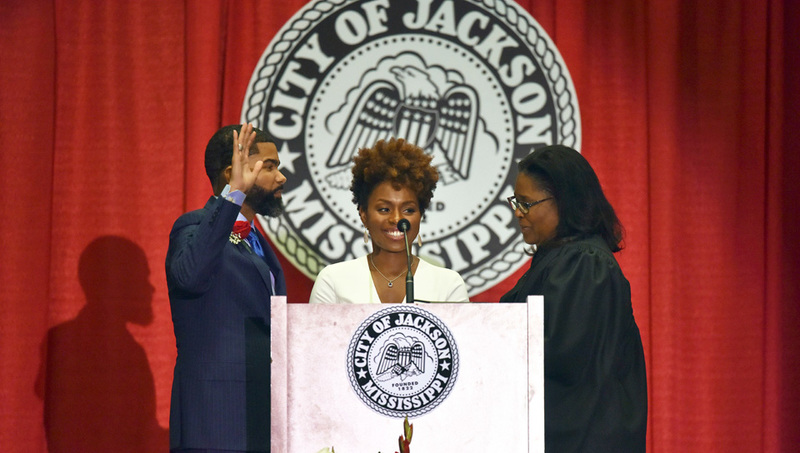 Chokwe A. Lumumba, left, takes the oath of office, on July 3. When I predicted that a young Black Illinois Democrat named Barack Obama would never be nominated or elected president, I based this on what is narrowly defined as politics in this nation founded by so-called “pilgrims” and “pioneers” from Europe. The “civilizing” mission they adopted continues to explain the Catch-22 of today’s Democratic Party: appealing to its pro-capitalist backers even while it tries to retain the respect of its historic base of working people, women, and racial minorities. Chokwe Antar Lumumba has just assumed the office of mayor of Jackson, Mississippi, surrounded by the hopes and adulation of leftists everywhere. What makes his election as mayor even more spectacular is that he won it in the heart of Dixie, capital city of one of America’s blood-reddest states. Mississippi sits at the center of the whole nation’s slave economy, which enriched both North and South, an economic system stubbornly held onto through one horrific war and later recalibrated anew as Jim Crow in peacetime. Lumumba will ascend to office with radical ideas. Before he supported same-gender marriage, Obama opposed it. And before that, he supported it! Which is just one of the reasons I predicted his quick demise from the political landscape: too much the finger-in-the-air kind of politician. His ideas were not as radical as Lumumba’s, although by some accounts of his early years, maybe they were just glossed over by the publicists at the Democratic National Committee. But they were radical enough in the areas of health care, social policy, and war to be unacceptable to the establishment. Then he became a candidate for the president of the world’s last colonial empire, which is stubbornly holding on in Puerto Rico, Guam, Saipan, Samoa, and Hawaii, not to mention its neocolonial interests and military bases just about everywhere else. What I never factored into my prediction about Obama was how fast he would willingly (or be forced to) recant his earlier progressive positions—single-payer healthcare is but one example—in order to seal the endorsement of the crowd associated with the Democratic Leadership Council, that right-of-left group formed by Bill Clinton and his Wall Street friends. Lumumba comes into office with a reported 93 percent of the electorate backing him and a platform to make Jackson, in his words, the most radical city on the planet. How loyally he remains with that electorate and true to his radical agenda will determine his real success. Voters are accustomed to candidates campaigning in poetry and governing in prose. Included in Lumumba’s platform is economic democracy. For example, he wants to establish a municipal fund to launch worker cooperatives. Born of a radical father of the same name, who changed his “slave” name to one honoring his African heritage (Chokwe is an ethnic group of Central Africa and Lumumba was the first independence leader of the former Belgian Congo), the younger Lumumba must know the pitfalls that await him. The model for how the establishment responds to such a radical insurgency continues to be the brief tenure of a 30-year-old “boy mayor” from Cleveland, Ohio. Dennis Kucinich was elected in 1977 as the youngest mayor of any major city, and he also came with radical ideas about housing for all and women’s and Black rights. When he recruited San Francisco Sheriff Richard Hongisto to reform and open up Cleveland’s corrupt police department, and Hongisto proved quickly to become a creature of that machine, Kucinich fired him. But Hongisto was the least of the young mayor’s worries. He had the banks and the city establishment steadfast against him, blocking his every move. A recall was mounted to oust him, and though Kucinich won, only barely, he was voted out at the end of his one term. Lumumba says his first order of business upon taking office is crafting a budget. When I heard this, I held my breath. Our democracies are not what the P.R. people tell us. Few mayors have real power, and since the 1970s, as more Blacks have won mayoralties, the establishment has managed to shift local powers to counties, states, and even to unelected bodies. St. Louis, for example, has this organization called Civic Progress, which is neither civic nor progressive. It is a cabal of the region’s corporations making sure the city stays on the right path in favor of business. It has been headed by such luminaries as St. Louis-based Monsanto. The new Jackson, Miss., budget may be the first indication of Lumumba’s prospects. The elder Lumumba, who died prematurely in office, was a leader in the Republic of New Afrika, a radical Black nationalist organization whose leadership also included Betty Shabazz, the widow of Malcolm X. When the elder Lumumba was elected mayor of Jackson in 2013, he wanted to hold quarterly people’s assemblies to open up the democratic process. I hope this desire did not die with him and will be revived under his son. Setting aside whatever pessimism I may have about our “democratic”—and “Democratic”—system, the younger Lumumba’s election is a call to action. Many actions. The Chokwe people fiercely resisted European enslavement. White, Black, First Nation, Asian, and Pacific Island workers and communities must become “Chokwe.” We must resist the main tenets of capitalism, wage slavery, racism, our “sky is the limit” profit system, obscene accumulation of private wealth, and an inferior brand of citizenship for so many marginalized groups (including all women, LGBTQ folk, people of color, etc.). We must resist not only within our respective communities but also together. We must be crystal clear about the nature of this fight. This resistance must be even more mobilized than the establishment’s is to defeat it. This will make it one of the most radical movements on the planet. And yes, maybe Jackson, Miss., will become its shining city on the hill.